I'm in stash-busting mode again. 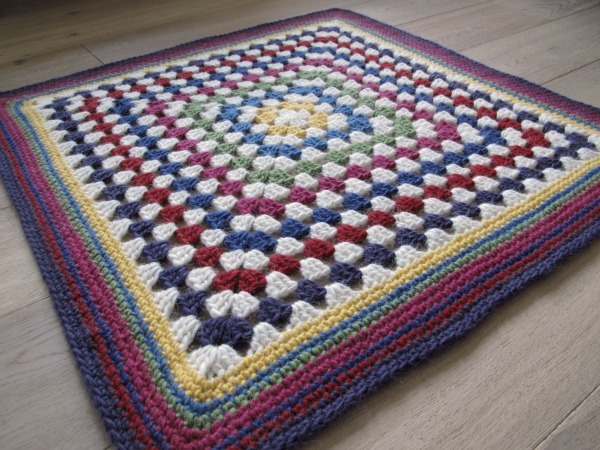 This time it's a simple granny square baby blanket that used up nearly all the balls of coloured Lopi I had lying around. I used a 6.5mm hook and basically made a big granny square totaling 15 rounds, then added 10 rounds of single crochet around the edge, alternating 2 rounds of one colour with 1 round each of the next two colours. I did run into trouble with the corners while doing the edging and had to fudge a little - but it's pretty even, if a little rounded at the corners, and I like how the colours look.